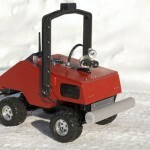 A high performance indoor obstacle avoidance robot. Based on Arduino Mega 2560, using several sensors, including multiple sonars. 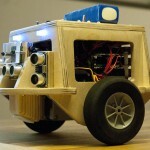 This robot also has a Raspberry Pi and a camera, that can be used for computer vision experiments. 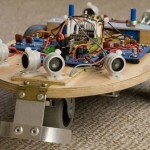 A small and simple balancing robot using a single Arduino, an MPU-6050 and stepper motors. All the design files, code and schematic are available for download. An Auduino Mega based obstacle avoidance robot I built to test a few ideas I had and learn more about what it takes to make robot robot that can navigate around an indoor environment without getting stuck on things. This is a two wheeled self balancing robot designed to look interesting, and at the same time work as a platform for experimenting with more advanced things than my other robots where capable of. 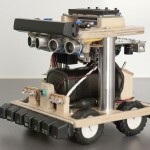 This robot is based around multiple Arduinos and one Raspberry Pi. 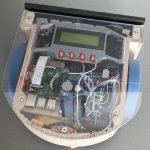 ArcRover is an outdoor rover with GPS based on the Raspberry Pi. 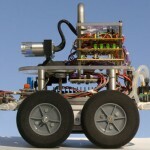 This robot was platform for developing network communication applications, navigation algorithms and data acquisition. 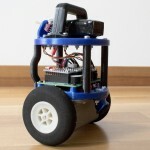 EquipoiseBot is my two wheeled self balancing robot project. It can be controlled using a home built IR remote. This is my fourth robot built in the autumn and winter of 2011 – 2012. My third robot can navigate around a route with pre programmed waypoints using GPS. My second robot can drive around autonomously in an indoor environment and avoid obstacles, just like my first robot, but this one has more sensors and a more complex behavior. 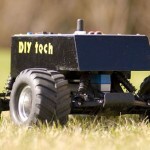 I built my first robot in 2008. It can navigate in an indoor environment and avoid obstacles. It uses three home-built ultrasonic range finder sensors.